WASHINGTON, D.C. -- Americans who identify as lesbian, gay, bisexual, or transgender (LGBT) are more likely than non-LGBT Americans to report that they lack health insurance. While the percentage of LGBT adults without health insurance has decreased significantly since the Affordable Care Act's provisions requiring Americans to have health insurance took effect at the beginning of 2014, they are still more likely to be uninsured than their non-LGBT counterparts. The LGBT community is one of the many constituencies targeted by the Obama administration for participation in open enrollment for health insurance under the provisions of the Affordable Care Act, commonly known as "Obamacare." 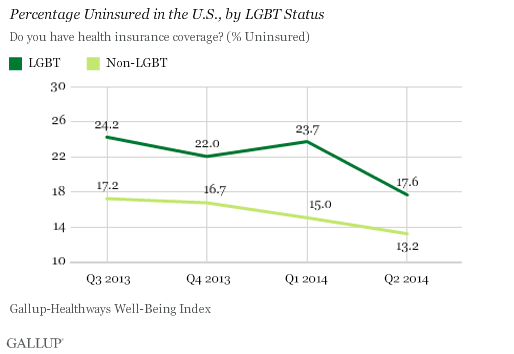 Gallup-Healthways Well-Being Index data suggest that both LGBT and non-LGBT populations saw similar drops in their uninsured rates. The most useful time periods for comparison are the fourth quarter of 2013 -- the three months before provisions requiring insurance took effect -- and the second quarter of 2014, after open enrollment ended. Between those two periods, the percentage of uninsured LGBT adults fell by 4.4 percentage points, similar to the 3.5-point drop among non-LGBT Americans. One possible symptom of the health insurance gap by LGBT status is that LGBT adults are significantly more likely to say they did not have enough money for healthcare needs at least once in the past year. 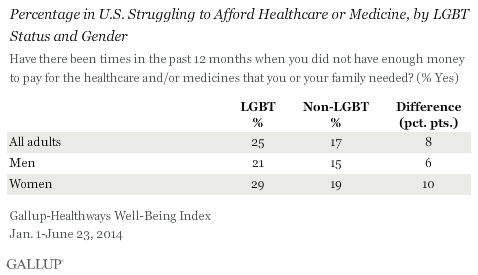 One-quarter of LGBT adults report they did not have enough for money for healthcare needs at least once in the last year, compared with 17% of non-LGBT individuals. This disparity is evident for both men and women. LGBT adults are more likely than non-LGBT adults to report that they do not have a personal doctor (29% vs. 21%, respectively). 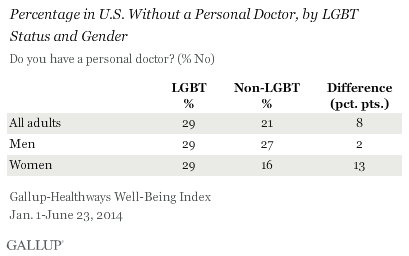 But this difference is driven primarily by LGBT women, who are nearly twice as likely as non-LGBT women to lack a personal doctor, 29% vs. 16%. The difference between LGBT men and their non-LGBT counterparts is not significant. Gallup-Healthways Well-Being Index data suggest that LGBT adults experience hurdles in accessing health insurance and resources. These findings are consistent with a 2013 NHIS report showing that LGB individuals experience some disadvantages in their access to healthcare. Compared with their straight counterparts, bisexual adults, both men and women, and lesbians were less likely to report a usual place to go for medical care and more likely to report not seeking needed medical care because they could not afford it. However, unlike the results from the Gallup-Healthways Well-Being Index, there were no differences in health insurance coverage by sexual orientation in that study. 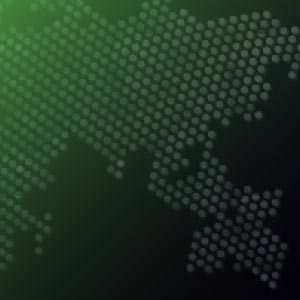 Population-based data sources that provide insights into the health and well-being of Americans and include the measurement of sexual orientation and gender identity remain rare. More routine inclusion of these data on demographic, economic, and health-related surveys would improve the ability of researchers to not only document whether LGBT Americans experience negative health and well-being disparities, but why that might be the case. Understanding the "why" is crucial information to assist policymakers and health advocates in the development of policies and programs designed to reduce health and well-being disparities associated with LGBT status. Gary J. Gates is a Williams Distinguished Scholar at the Williams Institute, UCLA School of Law. A national expert in LGBT demographics, he has a Ph.D. in public policy from Heinz College, Carnegie Mellon University. Results for Quarter 3 and Quarter 4, 2013, insurance rates are based on telephone interviews conducted as part of the Gallup-Healthways Well-Being Index survey July 1-Dec. 29, 2013, with a random sample in Quarter 3, 2013, of 1,831 LGBT adults, and 43,906 non-LGBT adults, and a random sample in Quarter 4, 2013, of 1,569 LGBT adults, and 41,222 non-LGBT adults. All samples are based on those aged 18 and older, living in all 50 U.S. states and the District of Columbia. For results based on the total sample of LGBT adults in the 3rd and 4th quarters in 2013, the margin of sampling error is ±3 percentage points at the 95% confidence level. For results based on the total sample of non-LGBT adults in the 3rd and 4th quarters in 2013, the margin of sampling error is ±1 percentage point at the 95% confidence level. Results for the questions asking about healthcare or medicine affordability and having a personal doctor are based on telephone interviews conducted as part of the Gallup-Healthways Well-Being Index survey Jan. 1-June 23, 2014, with a random sample of 2,964 LGBT adults and 81,134 non-LGBT adults, aged 18 and older, living in all 50 U.S. states and the District of Columbia. For results based on the total sample of LGBT adults interviewed Jan. 1-June 23, 2014, the margin of sampling error is ±2 percentage points at the 95% confidence level. For results based on the total sample of non-LGBT adults Jan. 1-June 23, 2014 , the margin of sampling error is ±0.4 percentage points at the 95% confidence level. The uninsured rate in the U.S. held at 13.4% in the third quarter of 2014, unchanged from the second quarter, but still down 3.7 percentage points since the fourth quarter of 2013.